Titanium-built, with a laser-etched name, it follows Apple's slick design. If you could have an Apple-built computer, a smartphone, a watch, some headphones, heck – maybe even a car, then why wouldn't you have an Apple credit card, as well? We can only speculate this type of conversations took place in the Apple boardroom because we were recently greeted with just that, an Apple credit card. The card itself is designed to work solely and exclusively with the Wallet app which you can find on your iPhone. Yes, you get a physical card (and a fancy one, at that), but you can't use it without the Wallet app. 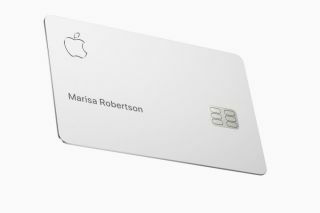 Announcing the card, the company CEO Tim Cook said it was designed in cooperation with Goldman Sachs and Mastercard. It should be relatively easy to set up (a few minutes) and comes with a few perks of its own. The biggest one will probably be the fact that you get a two per cent cash back on anything you buy, immediately. For Apple products, it's three per cent. The app itself will allow its users to track their transactions, what they bought, how much they spent in different categories, and how much they owe. Apple apparently won't have access to any of those information, while Goldman Sachs “promises” not to abuse the privilege of having access to this data. It seems as there are no hidden fees, late fees, annual ones, international ones or over-limit ones. The physical card itself is made out of titanium, with the owner’s name laser-etched on it. As with all Apple products, the design is slick and minimal. The card doesn’t show a number, an expiry date or anything. You can find more details about the card on this link.